The Mid-Autumn Festival, better known as the Mooncake Festival, is traditionally a harvest festival in China. With the Chinese diaspora, the celebration of this festival can be found wherever there is a Chinese community. Whilst the celebration is originally meant to mark the end of the harvest season, there are several traditional practices carried out in association with this festival. One of them is the worship of Chang-Er, the moon goddess in hopes of being blessed with a flawless complexion like the moon whilst others pray to her for a good husband. The offerings consist of mooncakes, water caltrop (Trapa natans syn. bicornis), mini yams and pomelos (pummelos - Citrus maxima or Citrus grandis); round fruits symbolises the fullness of the moon and of family harmony. 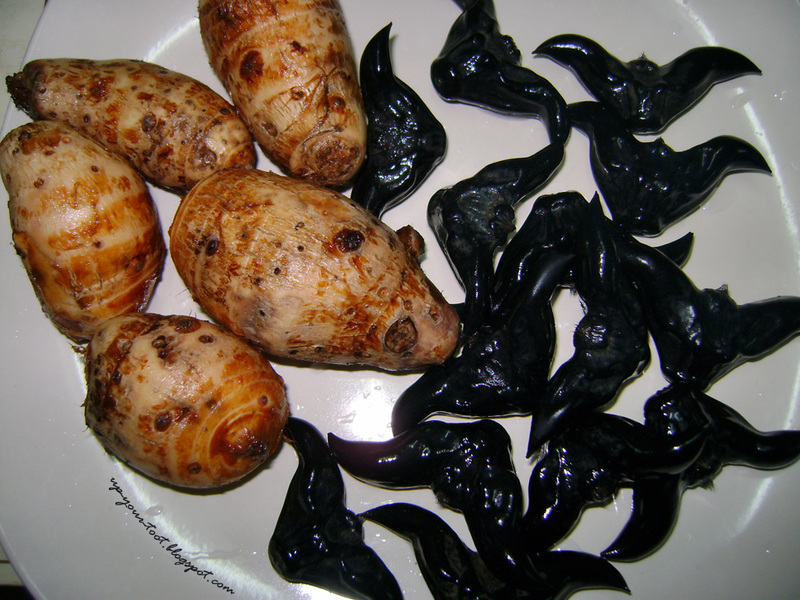 The mini yams (we call it Pinang Or - betelnut yam) and water caltrop (菱角, ling kok a.k.a. Jesuit Nut/Devil's Pod) that is usually only eaten during the Mid-Autumn Festival. Some go to the extent of peeling pomelos and ‘mini’ yams on this full-moon night in hopes of achieving this ‘flawless’ complexion of the moon. Of course with modern science and space exploration, no women in her sound mind would want a complexion like the moon; for the surface of the moon is dry, cracked, and full of craters and blotchy markings. 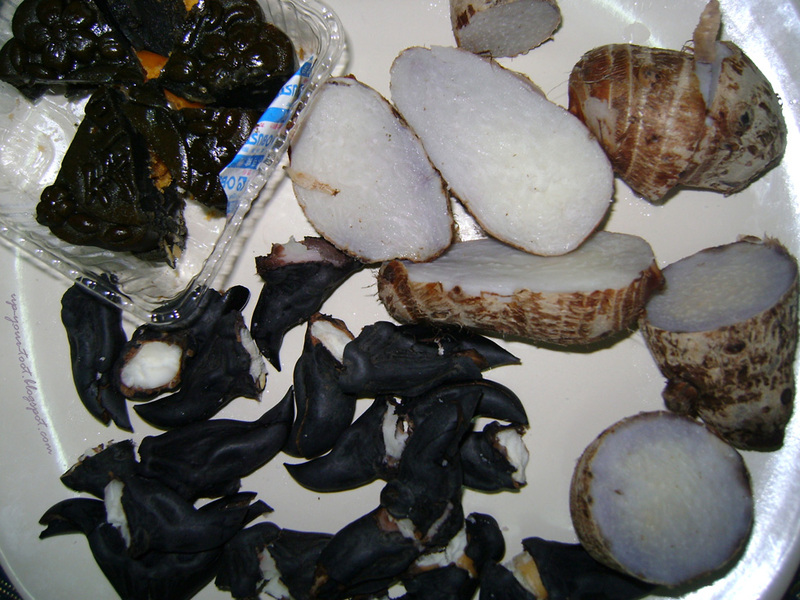 Cooked and cracked water caltrop, boiled 'mini' yams and mooncake for Mid-Autumn Festival. The mooncake festival is also a time for family reunion. After all, you get your whole family involved in the harvest in the olden days. So what better reward after the hard work than a family gathering where one can eat, drink and be merry together. Baker's Cottage mooncakes - had this for an office gathering. 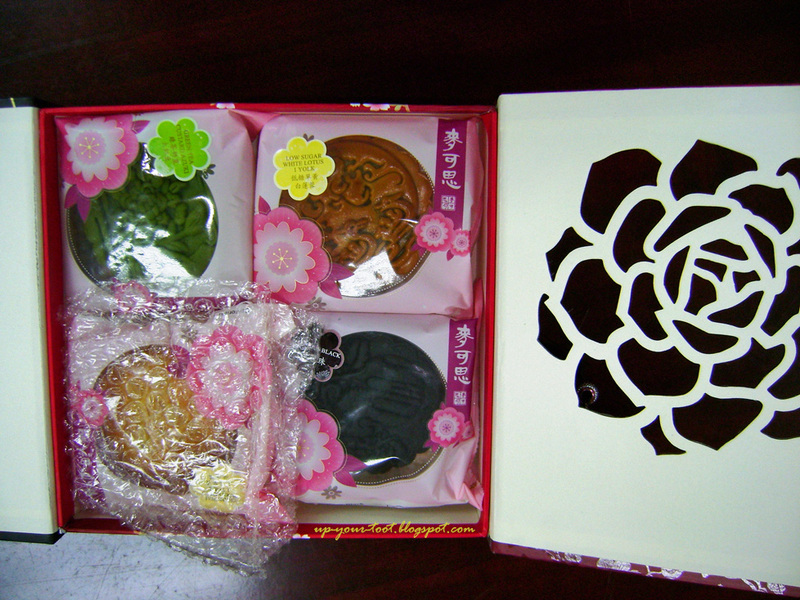 Clockwise from top left: Green tea red bean paste, Low sugar lotus paste with one yolk, Precious Black (charcoal powder) and Shanghai mooncake (flaky pastry skin). The bearing of lanterns during this festival comes from the 14th century revolt by the Chinese against the Mongols whereby the Chinese overthrew the Yuan (Mongol) dynasty in an uprising brilliantly hatched by lantern-bearing messengers who delivered mooncakes with hidden messages. The usually elaborate and decorative box that you get when you buy mooncakes. 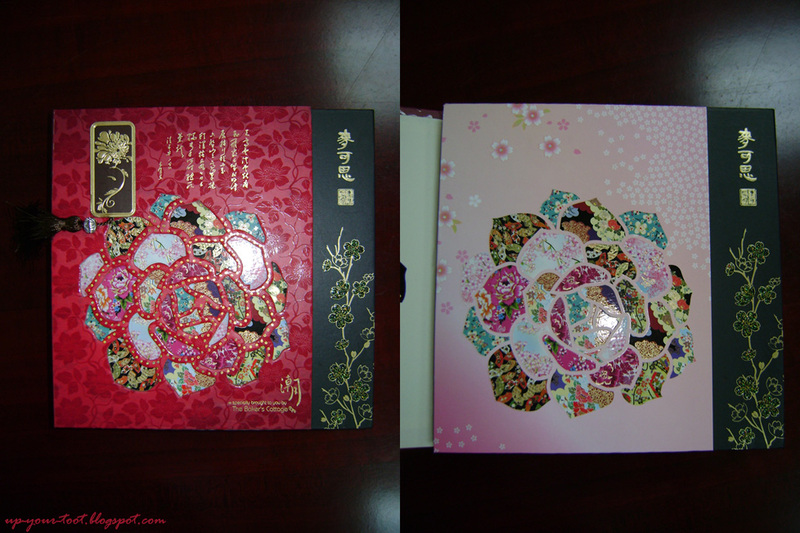 Click here for last year's mooncake box from this company. 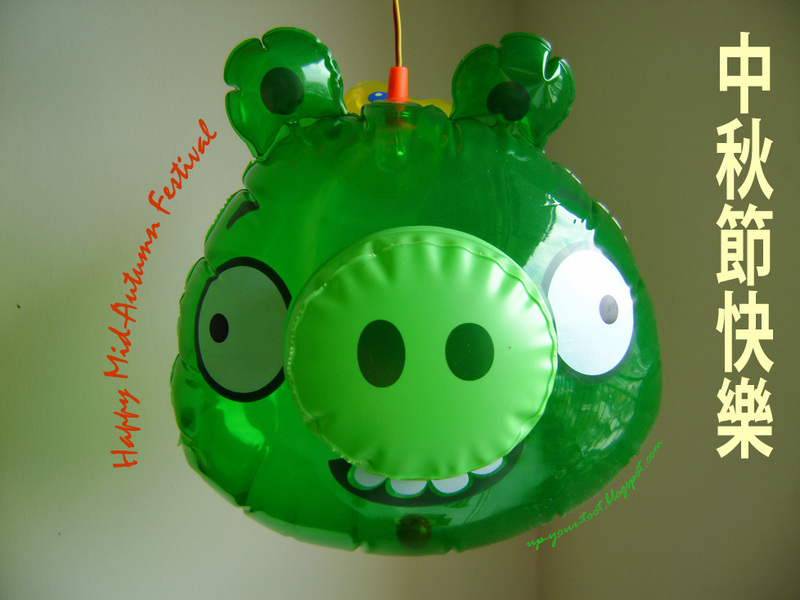 Nowadays, kids go around bearing lanterns that is made from paper or plastic, lit by candles or by LED lights, traditional or characters of popular cartoons and games e.g. Ben 10, Tweety Bird, Angry Birds, Batman etc. 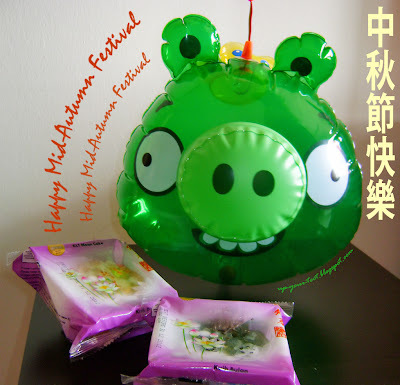 So Happy Mooncake Festival 2012 to all. Eat and be merry. Tahun ni tak dapat mooncake. During my childhood I look forward every year pergi Klang buy lantern so I can play with my neighbour. Tapi zaman dulu takde lantern superhero character. Usually goldfish or dragon. Now that you've mentioned it, dulu masa saya kecil dulu memang selalu dapat lantern dragon atau fish made of cellophane paper. At times the lantern would catch fire if not too careful with the candle. I should buy lantern for my babies next year and go hunting snail...hahaha...tactic cari assistant. Ahahaha, tactic yang sangat bagus. Gerenti ramai assistant yang sanggup cari snails.